It was a delicious, delicious weekend. I got an okonomiyaki-making lesson from Hana, visited a cheese farm on Vancouver Island and continued work on the development of a new top-secret cocktail recipe. More about all of that later. 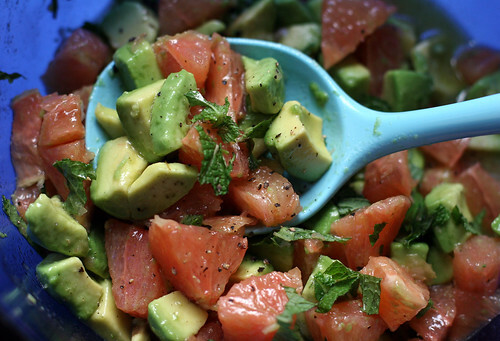 Beginning tonight, with this grapefruit, avocado & mint salad. That salad looks so refreshing - I wish it wasn't 9:26 am, and that I had all of those things handy right now, and that I was eating the salad somewhere sunny, where I wasn't wearing work clothes and sipping a tepid Chai latte. Envy! Want!